I and two colleagues from the South Jersey Camera Club joined a group to journey into some areas of the Pine Barrens including the two parcels of the Franklin Parker Preserve. The group was the Delaware Valley Ornithological Club and we rode their coattails. The boisterous, outspoken, enthusiastic leader was Dr. Emile De Vito of the staff of the New Jersey Conservation Foundation who did an excellent job of herding us and informing us. The mission was to see birds. The birders did; I didn’t see very many, and photographed even fewer. But it was a beautiful day and there was some pretty scenery. This is a reservoir which accrued a water supply for the irrigation of the cranberry bogs during the growing season. The pink blossoms are on a swamp maple. 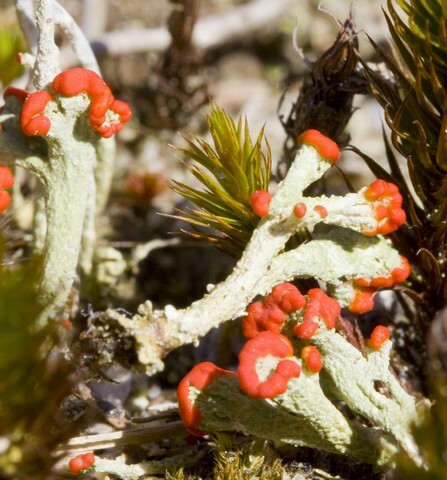 Here was some colorful British Soldier Lichen along the trail. 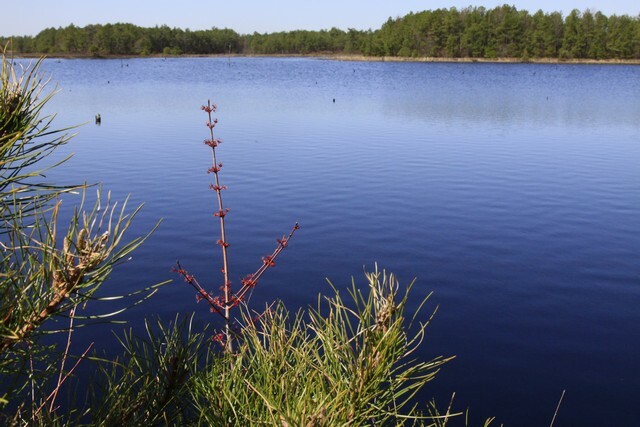 The cranberry bogs were created on land that had supported the growth of Atlantic White Cedar. 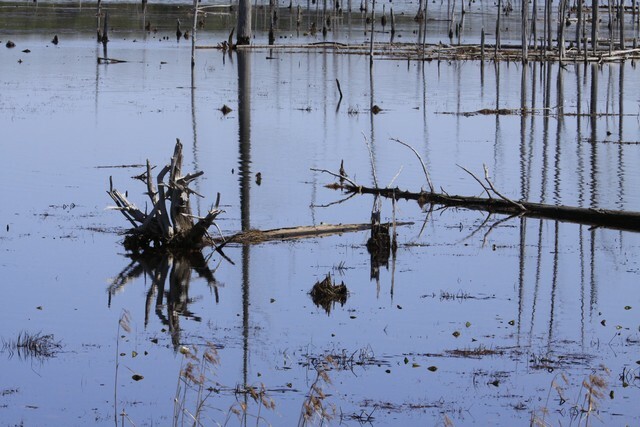 The above scene from the Styx-like waters shows the remains of some of those forests. And, finally, my token bird shot for the day. I don’t even know what it is but perhaps someone who does will tell me in a comment. 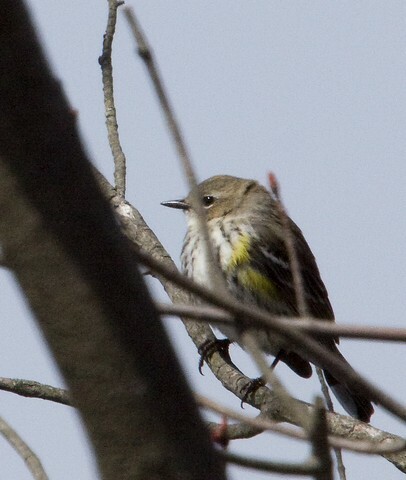 (See the comment – click on Comments below – by LauraInNJ identifying the bird as a Yellow-rump Warbler. Thanks, Laura.) We did see an eagle nest with the mother (according to Emile) sitting on her egg. One could see it with the birders’ spotting scopes but it was too far even for my 560mm lens. In any event it’s nice to know the eagles are nesting out there. Nice collection, at least you got one cute bid photo. Yellow-rump warbler… we birders call them Butter-Butts cause they have that same pretty yellow on their… butts. Thanks. I knew someone would square me away. I also looked at your blog and when I saw your picture of “Russell, the plant geek” I figure you were amidst the Crowberry on the trip of the 21st. And you were apparently as dazzled as I was. Oh well, it’s exotic in closeup. Nice photo’s and I wish I had gone with you guys. Never been out there.